In our house, we still like to eat a big breakfast, even though it is summertime. Pancakes are definitely a Saturday morning staple despite the temperature outdoors! These tropical coconut cream pancakes are the perfect summer Saturday morning treat! They are filled with shredded coconut and topped with both a coconut cream glaze and golden toasted coconut. Pancakes turn out best if you use a cast iron griddle. It's like all natural nonstick and also give them a great golden color without burning. If you don't have a cast iron griddle, just use a frying pan, and make sure to grease it well! Heat a cast iron griddle or pan on medium heat before you begin. Make sure it is nice and hot and then lower the temperature before you begin cooking the pancakes. Beat together the egg, milk, and melted butter. Whisk in the vanilla and coconut extracts and shredded coconut. Whisk the flour, baking powder, and salt in a separate bowl. Slowly whisk in the egg and milk mixture. It's ok for the batter to be a little lumpy, be careful not to over mix. Let it sit for about five minutes. The batter will puff up, if it is too thick, add a little more milk. Grease the griddle. Spoon the batter in about a 1/4 cup portions on the griddle and let it cook for a few minutes per side. Keep the pancakes warm in a 200 F oven. Whisk the whole milk, powdered sugar, and vanilla and coconut extract together. 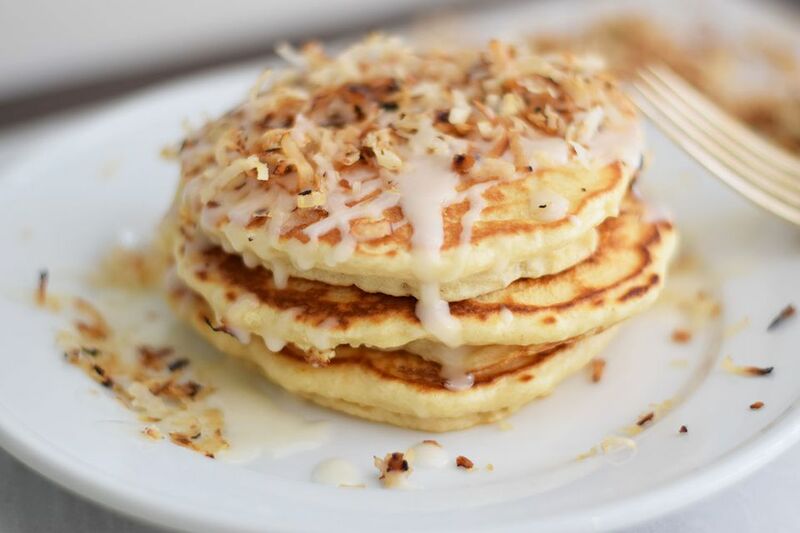 Drizzle the glaze over the pancakes and top them with the toasted coconut.